What is the secret to making your Tampa Bay wedding day memorable for your guests? 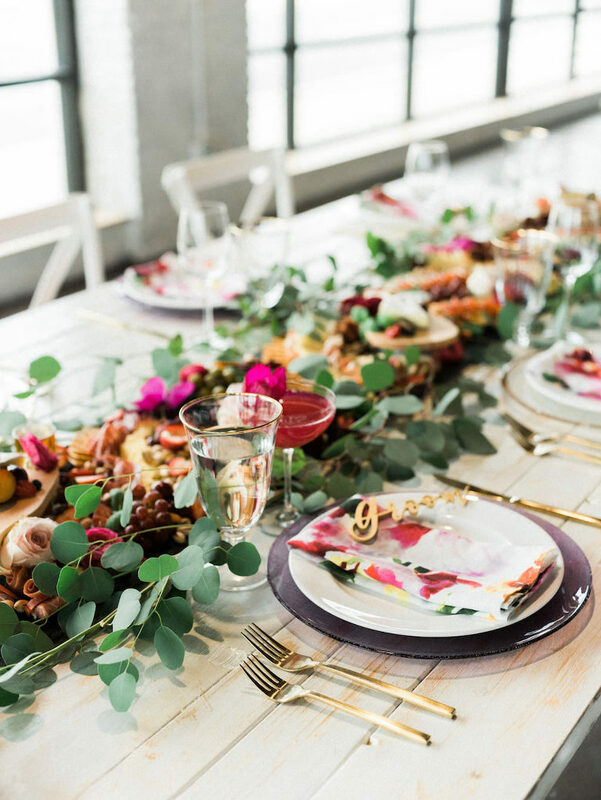 As much as your friends and family will ooh and ahh over the decor, if you leave them hungry, that’s what they will remember about your wedding night. 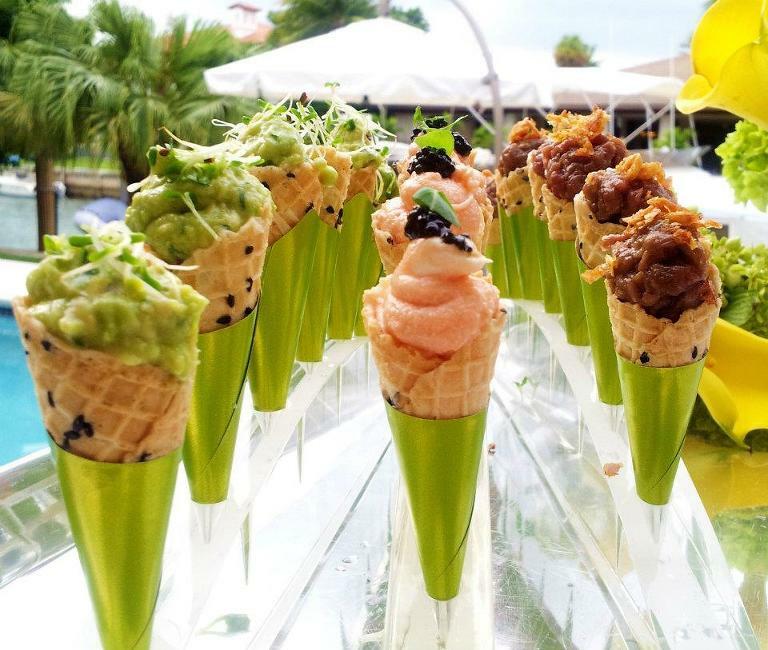 Every couple wants to make their wedding unique and personal, so in addition to what food you offer at your wedding, HOW you serve it can add to the guest experience. “Regardless of the style you choose, you shouldn’t compromise on the quality of service, nor food. You should choose from menu options you love while knowing your guests and all the details are taken care of while you’re enjoying your first meal as a married couple,” Casey Grawien, owner of Tastes of Tampa Bay, explains. 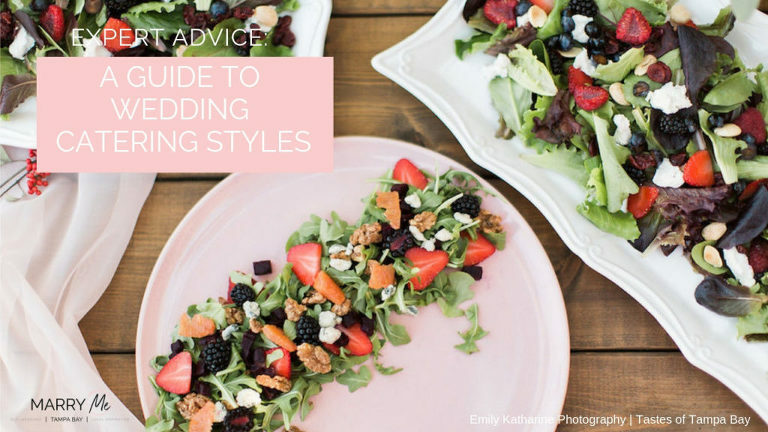 We asked Tampa Bay’s best wedding caterers, Tastes of Tampa Bay, Elite Events Catering, Amici’s Catered Cuisine and Olympia Catering to share their expertise for A Guide to Wedding Catering Styles. A great start to choosing your wedding catering styled is to book your venue. From there, it will narrow things down considerably. No outdoor access? No food truck! Limited service area? No stations! Next, take an overall look at your budget and desired dinner timeline. If you’d like to keep things expedited and traditional (toasts, speeches, etc. ), a plated meal is for you. Seated, sit-down, or plated, these terms essentially mean the same thing. Guests are seated at their respective tables, their meal is brought out from the kitchen by serving staff and placed in front of each guest much like in a restaurant setting. The menu is pre-determined by the host of the event. They may provide all guests with the same meal or they may allow their guests to choose from different entree choices, such as chicken, beef, or fish. Some people prefer a seated dinner because they feel that it is more formal. Others may be worried about the quantity of food being served to each person. Will it be enough? A plated meal with entree choices is more work for the couple to track because they will need to track each guest’s meal selection and provide that to the caterer by table. In addition, they will need to have a place card at each place setting with the appropriate meal choice indicated for the service staff. A plated meal is a more formal presentation of your guests’ meal and requires additional staff to handle, as the meal is presented to them at their assigned seats and timing for your dinner is more easily handled. However, during a seated dinner your guests do not have the opportunity to mingle as much during dinner and guests do not have the opportunity to have seconds on any of the food being offered. This type of service has been gaining momentum over recent years. It is similar to a plated dinner in that guests do not have to leave their tables to get their food. However, it is different in that instead of individual meals being set in front of each guest, serving bowls and platters are brought out to each guest table for guests to pass around the table. Think Thanksgiving at Grandma’s house. Many people like this service style because they think it lends itself to more camaraderie and conversation as food is passed from person to person at each table. This does require more table space so larger tables and/or smaller centerpieces work well with family style service. Pricing can be more expensive than a plated meal depending on the caterer because some will actually bring more food overall to accommodate the tables that empty their serving platters and ask for more. In this scenario, guests go to a buffet table, get their food, and take it back to their table to sit down and eat. In hotels, this style of service is typically more expensive than a seated dinner, but for off-premise catering, it is usually less expensive than a seated dinner. Naturally, there are exceptions to every rule. Some couples like buffets because guests can actually choose what they will eat. Others dislike buffets because they imagine long lines of guests waiting to eat. Some caterers will set up their buffets as “self-serve” while others will have staff behind the buffet line serving the guests as they come through to expedite service and enhance the overall guest experience. A buffet offers a more casual atmosphere and lends itself to allow your guests to mingle during the dinner offering. They can return to the buffet for second helpings, and there are usually more food options available on a buffet than a sit-down dinner. A buffet lends itself to easily presenting a themed presentation and food selection, but dinner can run longer than anticipated because guests can return to the buffet for second helpings. If you don’t have the budget for the service and rentals costs a plated meal adds, a buffet is for you. Keep things fun and relaxed and have food truck service by combining a food truck served entree with a dinner buffet. Customized selection lets guests choose from what they want while keeping a timeline on track. Food stations tend to be “active” stations meaning that something is being prepared in front of the guests at each station. This can offer an entertainment element or be more experiential for the guests than a typical buffet setting. Take, for instance, the beloved pasta station where multiple types of pasta, sauces, proteins, and accompaniments are available based on what each guest wants. 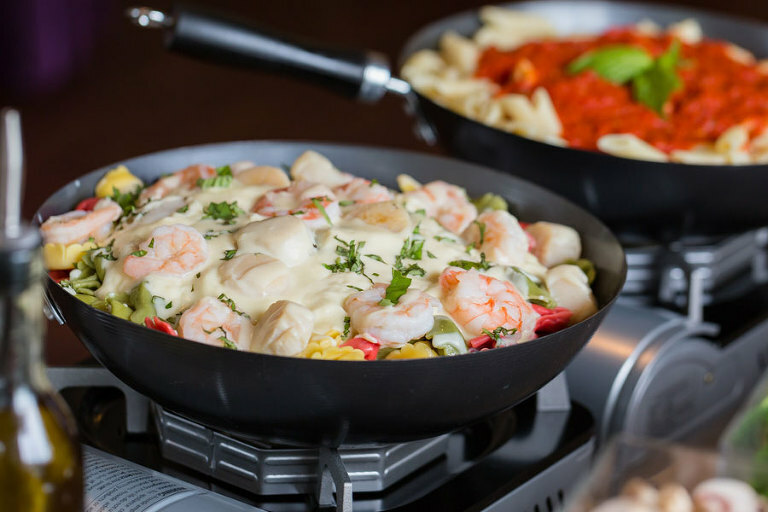 The station chef will combine the ingredients requested by the guest in a pasta pan and toss over heat, creating that guests requested dish. Sometimes service times can be lengthier with stations depending on the size of the event. Stations also take up more space in the room. This can be a good thing if you have a smaller guest count and a larger room but is not good if you are maxing out the space of the venue. Stations can allow more creativity in terms of station decor and what vessels the food is actually being served in. Things like Asian take-out containers for stir-fry or mini-iron skillets with individual baked macaroni and cheese can be fun and unexpected. Food stations tend to be one of the more expensive styles of service because there is typically more food overall, more china, and more staff involved. In my opinion, this term actually refers more to the seating available to guests than to the service style of the food. With a cocktail style type reception, there is typically not seating for all of the guests. There may be some seating, but there are also tall cocktail tables and/or furniture groupings available. The “meal” in this scenario may be active stations or passed hors d’oeuvres or a combination of passed and table-presented hors d’oeuvres, featuring “grab and go” items that don’t require knives to eat. A cocktail-style reception promotes a very casual atmosphere and allows for smaller portions of more food options for your guests. Though this service styled does not usually offer seating for all guests at a designated time and guests can congregate around different stations, making it more difficult for others to reach the items being offered.